Having spent much of the last two years watching the highly impressive SNP spin-machine in action, it occurs to me that they are in fact expert practitioners of a kind of mass Neuro-Linguistic Programming (NLP). For those unfamiliar with the concept of NLP1, our old friend Wikipedia explains that it's a system for exploiting the existence of "...a connection between the neurological processes ("neuro"), language ("linguistic") and behavioral patterns learned through experience ("programming") and that these can be changed to achieve specific goals ...". Of course all political parties use carefully chosen language to try and programme the electorate to their way of thinking; we live in an age of endlessly repeated soundbites, of pithy phrases designed to penetrate the consciousness of the short attention-spanned. But what sets the SNP (the SNLP?) apart is the sheer audacity with which they're willing to relentlessly repeat not just partial truths but demonstrable falsehoods. The mainstream media sometimes (although all too rarely) highlight the dissembling duplicity of the SNP's public pronouncements, but the SNP have immunised themselves against this by spending years patiently undermining all media sources except those they favour (which funnily enough tend to be the ones they have created or effectively control). It could be argued that the SNP's most impressive achievement has been to enable their supporters to give themselves permission to ignore all dissenting voices. By their very nature, you'll be familiar with the sorts of phrases that I'm referring to. "[Scotland has] paid more tax per head of population every year for the past 34 years." "Scotland's GDP per head is £2,300 higher than UK as whole"
"Scotland is the 14th richest country in the world"
These carefully chosen and endlessly repeated boasts were of course all dependent on oil revenues, so they're no longer valid. Take a meander through the remoter natwaters of social media though, and you'll see that plenty still believe and repeat these half-truths. "We send more to Westminster than we get back"
"Independence would have made Scotland £8.3bn better off over the last 5 years"
"Oil is just a bonus"
"We will plan Scotland's public finances and borrowing requirement on the basis of a cautious forecast for oil and gas revenue"
"[SRIT would have] about double the effect on the taxable income of individuals at the lower income thresholds rather than people at higher income thresholds"
I won't repeat the arguments here, but the wrongheadedness of each of these statements have been well covered in this blog. Finally there's a category which is perhaps the most NLP-y of all: statements that can't be factually refuted and that imply (or explicitly claim) inevitability. Perhaps the most notable example of this during the indyref was "Are you Yes yet? The clear implication being that you inevitably will be, it's simply a matter of time. To be fair this is simply an example of good campaign language. I offer no criticism in this instance, just polite applause. But for me the most insidious example is "A Second Scottish Independence Referendum is Inevitable". This statement has the capacity to become a self-fulfilling prophesy if we allow it to become received wisdom. As a rule, people don't vote to make themselves poorer. The last indyref took place in the context of a period where - if you ignored up-to-date data, shut one eye and blurred the other when looking at historical figures and were willing to believe hopelessly optimistic oil forecasts - you could just about persuade yourself independence wouldn't make us worse off. Those of us who looked closely quickly drew a different conclusion. As as aside; I don't believe the fact that it would make us immediately worse of is in and of itself a reason not to vote Yes; but I do believe those campaigning for a Yes vote had a moral duty to be honest about the economic implications. This blog's existence is a direct result of the fact that they weren't, of my frustration with the transparent dishonesty of the Yes campaign's claims. Now - following the collapse in oil revenues - it's clear Scotland would be £8bn2 a year worse off as an independent country if all else stayed the same (which of course wouldn't be the case3). The best spin-machine in the world couldn't hide that fact under the intense scrutiny another referendum campaign would bring. No amount of artificial grievance-mongering or empty "social justice" rhetoric would persuade us to vote to make every man, woman and child in Scotland immediately £1,500 a year worse off . The SNP have been clear there won't be a second referendum unless they believe they can win it; they won't win it if a Yes vote would obviously make us all poorer. So what could change the fundamental economic situation, and are any of these things "inevitable"? Another windfall source of revenue could be found that generates £8bn+ a year in tax revenue and has the appearance of being sustainable. This could be oil & gas again (although the oil price simply returning to $100 won't be sufficient, as I explain here) or it could be we discover some other swiftly tax generating natural resource. Scotland's economy could miraculously boom such that our GDP (and therefore our tax revenue) growth outstrips that of the rest of the UK by 16% (the amount required to generate £8bn pa more income). The notoriously optimistic Independence White Paper itself argued that such levels of growth would take generations to deliver. There has been no credible case put forward for why further devolution (or indeed independence) should create superior growth for Scotland - the logic goes little further than "because Scottish people making decisions for Scotland"
The drive for more powers for Scotland could lead to the Barnett formula being scrapped or drastically altered. The Barnett formula underpins the calculation of the block grant, the block grant provides us with funds for public spending that's currently £8bn pa. more than our proportionate share of (current) tax generation would allow. Take this away - stop us from benefiting from the "pooling and sharing" that protects our public spending - and we lose the single strongest argument against voting Yes: the £8bn a year Union dividend. The third of these is of course made more likely by the SNP's persistent winding-up of the rest of the UK. If they persuade everybody that indyref II is inevitable it further helps their cause - why should the rest of the UK continue with pooling and sharing if it's inevitable that Scots will leave soon anyway? So next time somebody tells you that a second independence referendum is inevitable, maybe ask them why - then judge for yourself if you think their opinion has been reached through reason or programming. 3. Those things that "wouldn't stay the same" carry more downside risk in the short-term (issues around currency, trade, capital flight and transition costs) and the (highly debatable) upside benefits would take generations to materialise. The SNP spin machine has been in full effect over the last few days. They need to be. How can they defend their decision not to use the Scottish Rate of Income Tax (SRIT) to protect us from the spending cuts imposed by Westminster's austerity policies? 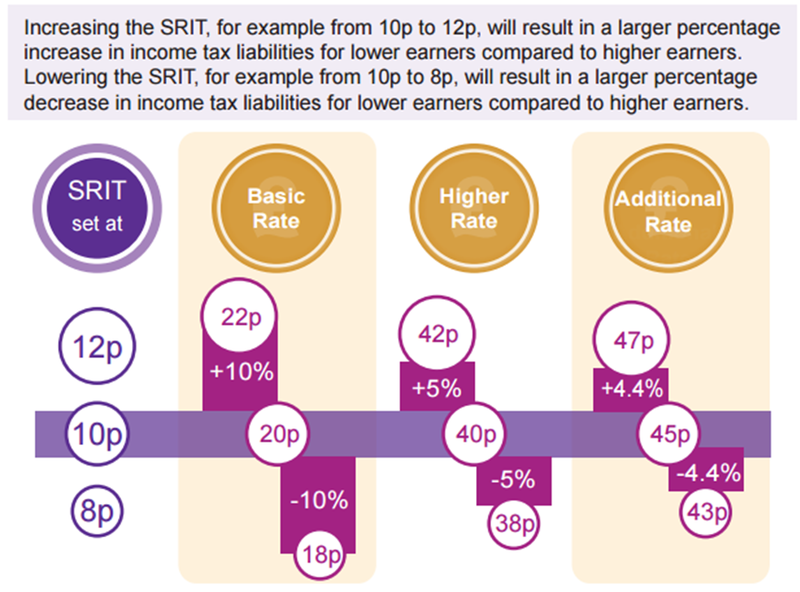 The Spin is pretty simple: because the SRIT has to be applied to all tax bands equally (true) it would unfairly hit the poorest hardest (untrue). "By its nature, exercising that power would have a disproportionate effect on the amount of tax paid by the taxpayers on the lowest incomes." 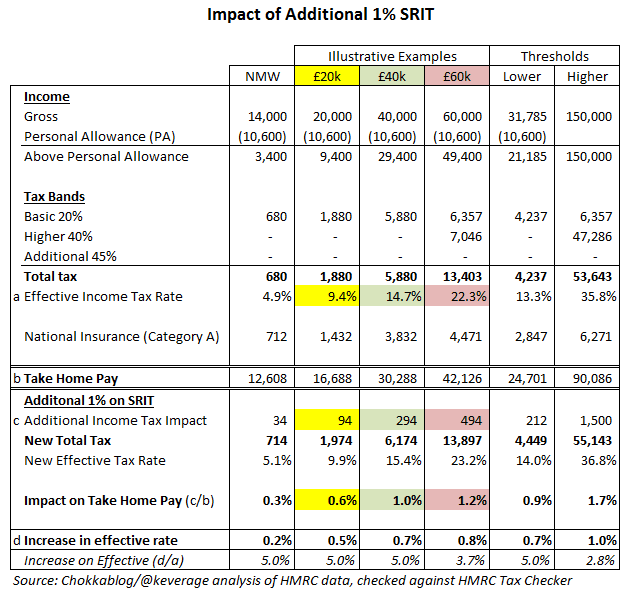 "It would have in fact been about double the effect on the taxable income of individuals at the lower income thresholds rather than people at higher income thresholds"
I could find plenty of other examples but anybody with ears knows that variations on this theme are being hammered into the Scottish consciousness: the SNP aren't using SRIT powers because they would hurt the poorest most. This (rather than governing) is what the SNP do best. 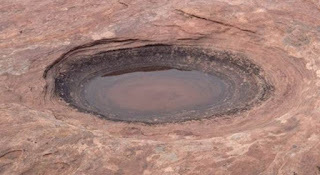 It's a kind of mass Neural Linguistic Programming; they select a few simple statements and relentlessly repeat them until they are received as wisdom by their trusting supporters. All political parties do this to some degree of course, but the lack of scrutiny applied to the SNP and their sheer brass-neck sets them apart. The intelligentsia may expose their soundbites as being deeply misleading or (as in this case) simply wrong, but that doesn't matter. Their supporters are well trained to ignore dissenting voices. We could assemble a greatest hits list: the ones that intentionally mislead by ignoring our higher public spending ("we generate higher GDP per capita", "we send more tax per head") or the ones that are - by any reasonable analysis - downright wrong ("oil is just a bonus", "we'd have been £8bn better off", "our oil forecasts were in line with the market at the time"). To the second list we can now add "using SRIT would hurt the poorest most"
So why is this assertion so misleading? As I explained in my last blog (Swinney: Confused or Aiming to Confuse), the suggestion that a flat increase to all tax rates (which is all that SRIT currently allows) hurts the poorest most plays on a simple intuitive misperception: people think the poorest pay 20% tax and the richest 40%, so 1/20 is twice as bad as 1/40. Their are a couple of problems with this, the biggest being that we only pay tax above a threshold (the Personal Allowance) which means that a higher proportion of higher earners' income is taxed1. 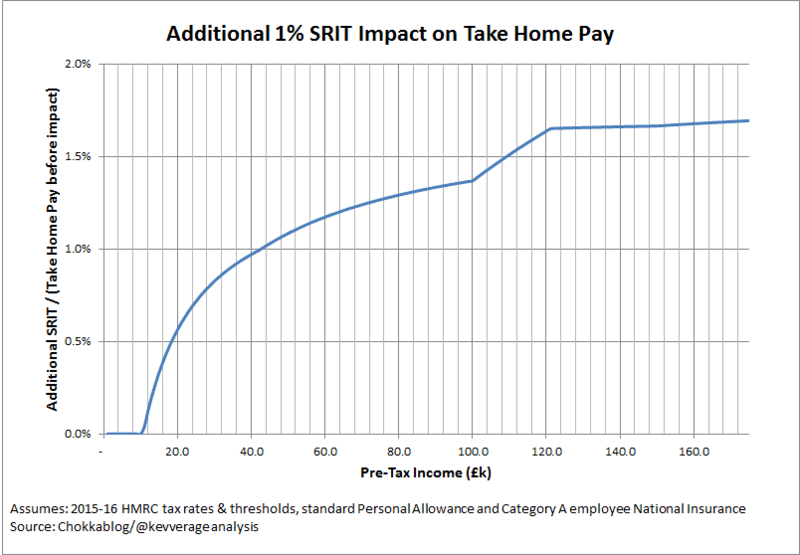 In my last blog I explained (using rounded figures) how an additional 1% SRIT would mean - because the first £10k of income (the Personal Allowance) is not taxed - someone earning £20k would pay £100 more tax but someone on £40k would pay £300 more tax . The wider point here is that this additional tax money raised could be used to alleviate the impacts of "Westminster's austerity policies". The additional money raised could be recycled into public spending in a way that defends our essential public services and protects the poorest in society. A simple person might think that the SNP - having campaigned as the "anti-austerity" party - would lose all credibility if they failed to take this opportunity to put their words into action. 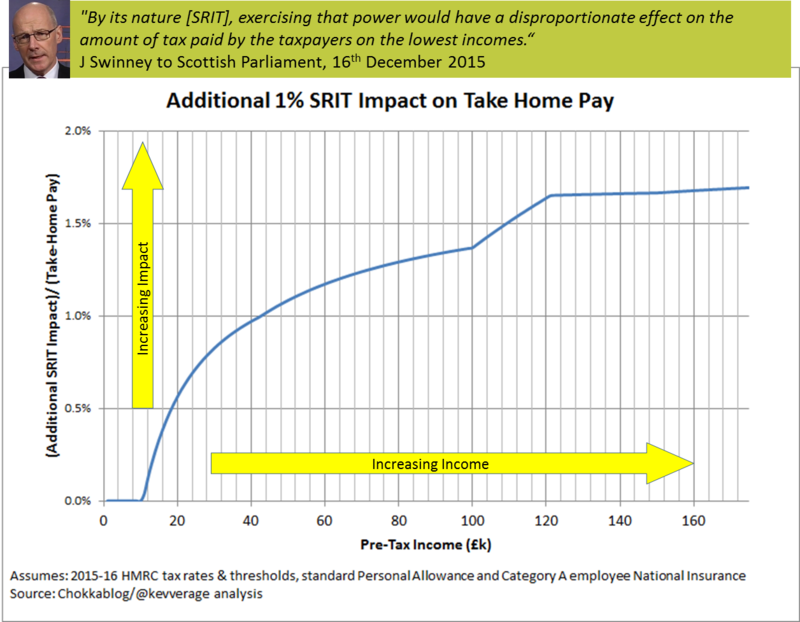 It is undeniable that the poor are affected, but to suggest (as Swinney has) that SRIT would have a "disproportionate effect on the amount of tax paid by the taxpayers on the lowest income" or "double the effect on the taxable income of individuals at the lower income thresholds rather than people at higher income thresholds" is at best intentionally misleading and at worst (as I would argue) it is frankly wrong. The last row in the table above is how the SNP attempt to justify the statement: you be the judge. Now regular readers of Chokkablog will know I do like a graph and this data screams out to be graphically presented. Just two graphs should do it. 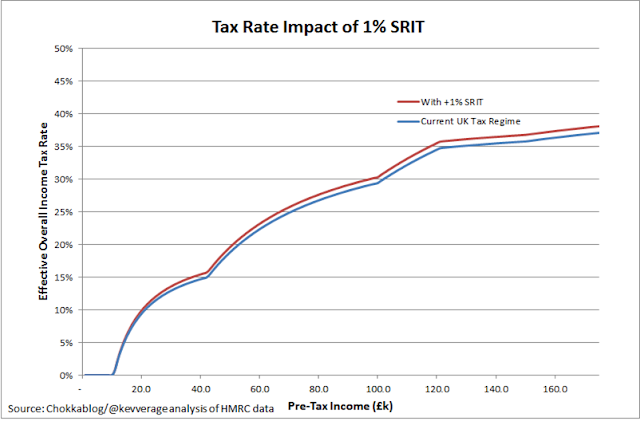 Note how the red line (the additional 1% SRIT line) diverges from the blue line (current tax policies) - the effect is magnified for higher earners. As an aside: the first curved section of the line is of course tending towards 20% (the maximum tax you would pay if there were no higher bands). Similarly the second tends towards 40% (the proportion of income taxed at less than that rate declines as you head further right). The change in profile between £100k and £120k is simply because the personal allowance is phased out for higher rate tax payers over this range - effectively accelerating us towards the 40%. The final additional rate kicks in above £150k, sending us on a line which is asymptotic to 45%. If you earn £1m you pay 43.6% tax (somebody asked). Now: you can argue that the incremental pound matters more to a lower earner and that existing SRIT powers don't allow us to avoid impacting all tax payers. They are valid points. 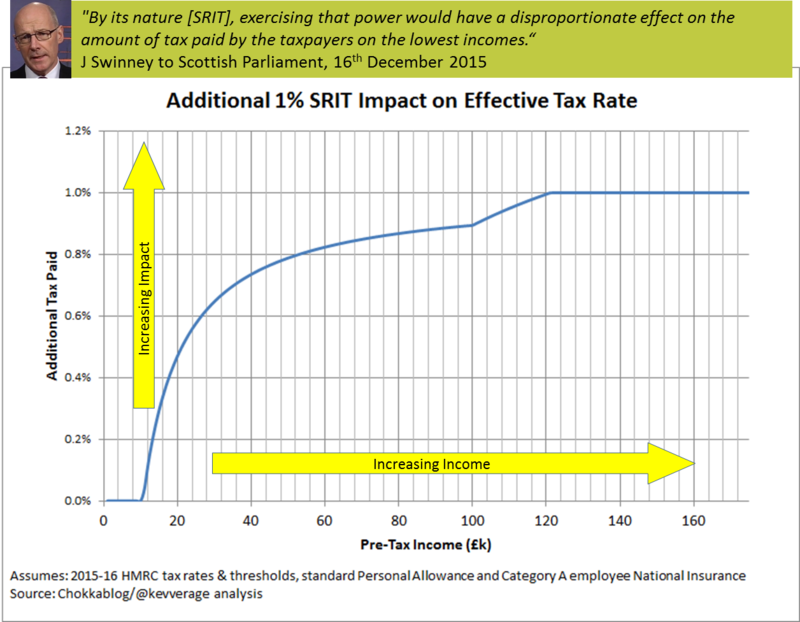 But when Swinney brazenly asserts that using SRIT powers would "have a disproportionate effect on the amount of tax paid by the taxpayers on the lowest incomes" or would have "about double the effect on the taxable income of individuals at the lower income thresholds rather than people at higher income thresholds" he is engaging in a conscious deceit. I'm not alone here (for example this We Need to Talk About Tax piece by Graeme Cowie covers similar ground), The good news for the SNP is of course that hardly anybody reads blogs like this - they won't be losing any sleep. Swinney: Confused or Aiming to Confuse? 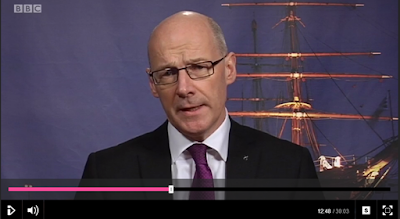 Last night (16/12/2015) on the BBC's Scotland 2015 programme John Swinney was asked why he had chosen not to use the Scottish Rate of Income Tax (SRIT) to mitigate the pressure on public spending driven by Westminster's austerity policies. "Well what that would have done would've put a disproportionate impact, and had a disproportionate impact on the incomes of people in low income households. It would have in fact been about double the effect on the taxable income of individuals at the lower income thresholds rather than people at higher income thresholds and I don't judge that to be the right way to deploy any tax raising changes"
Similar statements are now being parroted around social media. By seeding this misunderstanding Swinney shows that he either doesn't understand the effect of Personal Allowances on effective tax rates or that he is consciously trying to deceive the Scottish electorate. If all income was subject to tax then the statement above would make sense. 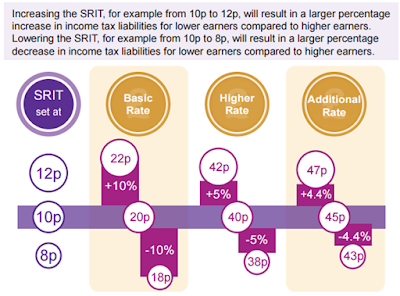 If for example low earners paid 20% on all income and higher earners 40% then adding a flat 1% additional tax to both would indeed be "disproportionate". The lower earners' tax burden would rise by 1/20 = 5.0% whereas higher earners would rise by 1/40 = 2.5%. I think this is how most people intuitively think about tax; it's an intuitive misconception that Swinney either shares or wishes to exploit. Maybe Swinney is unaware of this thing called the Personal Allowance, the threshold above which tax has to be paid? So the lower earner is seeing a further £100/£20k = 0.5% of their total income being lost but the higher earner sees a further £300/£40k = 0.75% of theirs. The simplest explanations is this: The Personal Allowance means that the higher an individual's earnings, the larger the proportion of their income that is subject to the additional 1%. I've used round numbers here to try and make the illustration clear, but they're pretty close to the actual figures. For those who like to see the actual numbers (and a graph) I include them at the end of this post. But this is about more than arguing over how to interpret percentages. These additional taxes would be directly available to the Scottish Government to alleviate spending cuts, to protect the public services on which the most needy in society depend. Let's take our worked example further: what does the Scottish Government do with the extra £400 they've raised from our two tax payers? Even if they couldn't find a way of spending it to disproportionately help the lower earner (as they surely could), both the earners in our scenario could benefit from £200 of additional public spending (their "population share" of the additional £400 raised). The net effect would therefore be that our lower earner would be £100 better off (because they pay £100 more tax but they benefit from £200 more public spending). This would have been achieved by our higher earner making a net contribution of £100 more (paying £300 more in tax but only receiving back £200 by way of public spending). Of course there are non-earners who could benefit from those additional taxes, which would be even more redistributive than the example above. 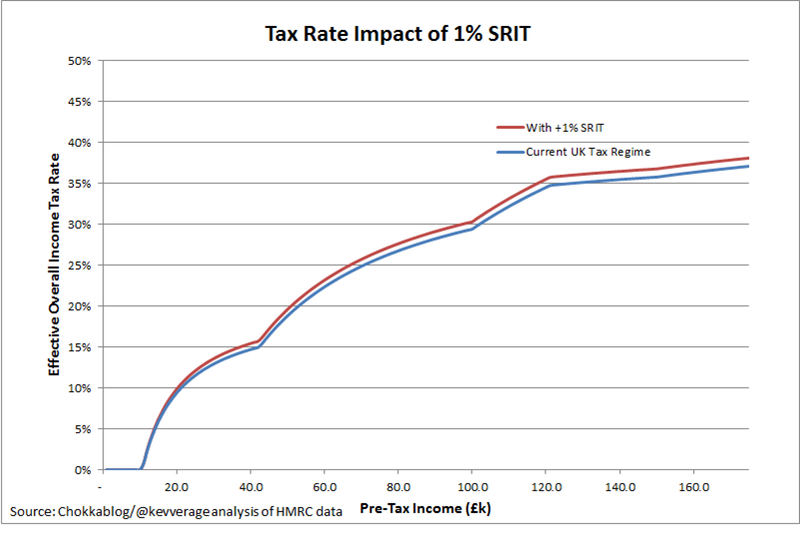 SRIT may be a blunt instrument, but it undeniably has the potential to redistribute wealth from the richer to the poorer. It appears to me that this statement is demonstrably untrue. If I'm right then Swinney is either an incompetent Finance Minister or a liar. It appears Swinney's figure comes from taking the %age increase in the %age effective tax rate (which is a bizarre way to interpret "proportionate impact" as the explanation above I hope proves - taking percentages of percentages nearly always leads to confusion). 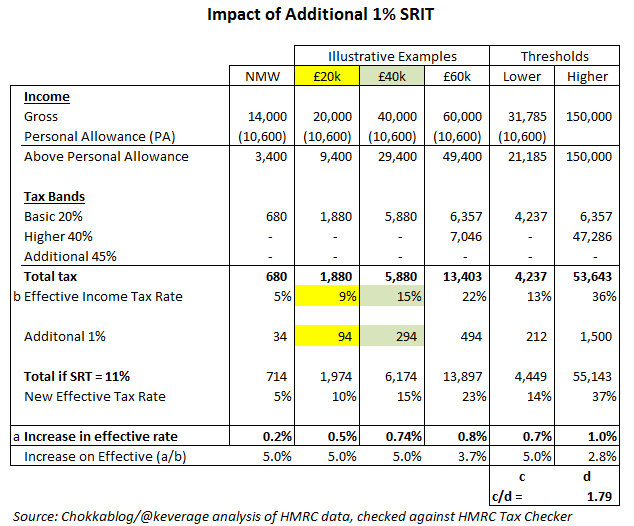 In our worked example (see table below) the effective tax rates are 9% and 15% respectively. If we take the increase in effective rate and divide it by the effective rate, our £20k and £40k earners both see a 5% increase (the numbers are rounded in the table; 0.47/9.40 and 0.74/0.147 respectively). At £60k the increase by this measure becomes 3.69% (0.82/22.34), at the higher threshold (£150k) the figure becomes 2.8%. So 5.0/2.8 = "proportionately 1.8 times more" i.e. double in Mr Swinney's rhetoric (I'm not quibbling abut 1.8 vs 2.0). If you've understood the worked example above, I hope you'll agree using this figure to argue that lower earners are disproportionately impacted is disingenuous at best. The Smith Commission powers being delivered through the Scotland Act 2015 will give the Scottish Government the ability to flex all income tax thresholds and rates. Let's hope that by the time those powers are delivered our SNP overlords have managed to understand how taxes work and/or start being honest about the choices they are making. The following graph shows the effect of the personal allowance (note the personal allowance gets phased out between £100k and £121k) and changing tax rates at different thresholds. Note how the red line (adding 1% to SRIT) subtly diverges from the blue line - this is the graphical representation of the dynamics this blog describes. I'm indebted to Andy Wightman for pointing out the existence of this incredibly misleading graphic (which simply ignores the Personal Allowances diluting impact for lower rate tax payers). I'm genuinely shocked to find it comes from this Scottish Parliament Information Centre (SPICe) briefing paper. Holyrood: we have a problem. With a title as enticing as "The sustainability of Scottish public finances: a Generational Accounting approach" you could be forgiven for not having read the latest paper to emerge from the National Institute of Economic and Social Research (NIESR). 1. "The current path for the [UK] public finances is unsustainable"
To address this now through tax increases (such that future generations would face the same fiscal burden as ours) would require an increase of between 3 and 10% to our total tax burden1. 2. "from a purely fiscal point of view, Scotland is better off without 'full fiscal autonomy'"
If the SNP achieve their stated aim of Full Fiscal Autonomy (FFA) for Scotland, we would be materially worse off. This is of course before allowing for the positive (or negative) impact of the different economic policies that FFA would enable Scotland to pursue. What's quite helpful about this analysis is you don't need to fully accept the first conclusion (or indeed the underlying premise) to be able to appreciate the second. By comparing their baseline projections for the UK and an FFA Scotland, the relatively greater scale of Scotland's economic challenge is revealed. 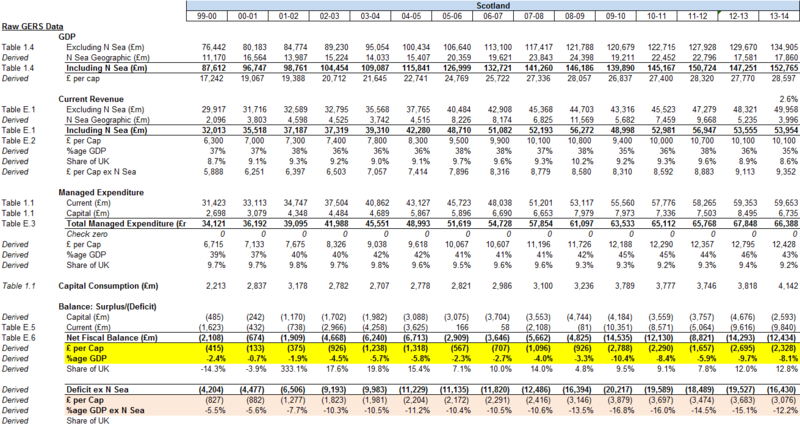 In FFA for Dummies and FFA for Dummies: Methodology we saw that the 15 year average onshore (e.g. 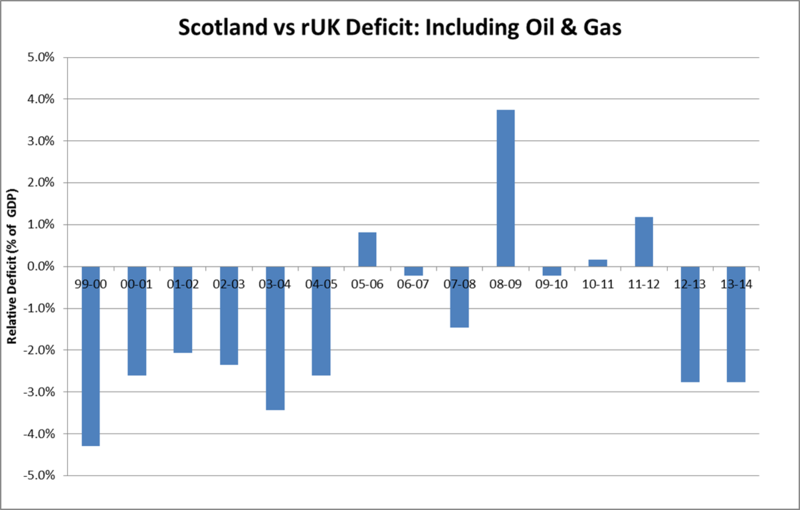 excluding North Sea revenues) deficit gap between Scotland and the UK has consistently been in the range of £8bn to £9bn a year. 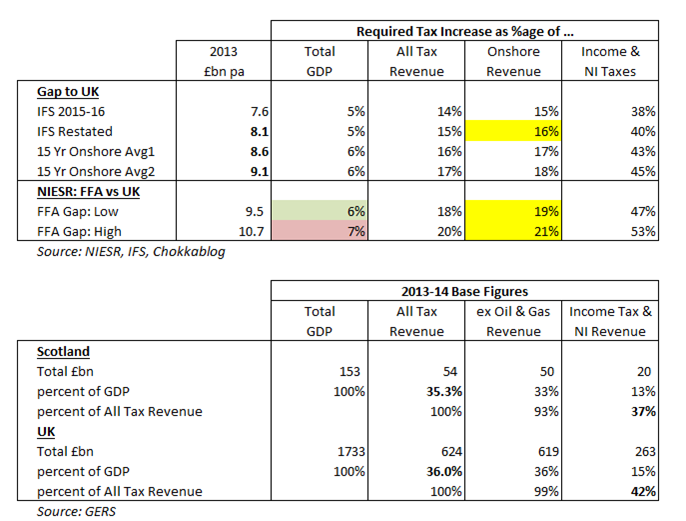 Given the OBR are forecasting only £0.1 - 0.2bn pa of oil revenue, this "without oil" analysis is increasingly apposite. Let's take the £8bn (low end of the range) and state that figure in the same terms as above: we would require a 16% increase in our total tax burden to close that gap. In March 2015 the IFS forecast a 2015-16 deficit gap of £7.6bn. The OBR oil revenue forecast they were using at the time was for £0.6bn - so simply adjusting for the latest OBR forecast of £0.1bn gives us a restated IFS deficit gap of £8.1bn. So again: we would require a 16% increase in our total tax burden to close that gap. As we've already said, the NIESR analysis of FFA suggests we would require a 19% to 21% increase in our total tax burden to close the gap. In 2013 cash terms that's £9.5 to £10.7bn pa. The reason why the NIESR FFA gap is wider is conceptually quite straight forward. Their analysis includes the same starting deficit difference (Scotland's deficit is higher than the UK's) and uses the same OBR assumptions for future oil revenues, but in addition they factor in the net fiscal implications of Scotland's different population age profile over time. At its simplest: Scots are on average older3 and receive higher age-adjusted per capita spending on education and pensions while generating a lower level of per capita income tax revenue. So common sense observations of historical trends and realistic assumptions about future oil revenue showed that FFA would (all other things being equal) require a 16% increase in Scotland's overall tax burden1. The NIESR have simply shown that if you add in Scotland's particular demographic challenges the scale of the fiscal gap will become even greater, equating to a c.20% increase in Scotland's overall tax burden. It's important to highlight that none of these analyses factor in the possible impact of FFA on Scotland's relative performance versus the UK, the extent to which FFA may allow us to close the fiscal gap through superior economic growth. Of course it's quite possible that FFA could be damaging to Scotland's economic performance, but even if you believe FFA is some sort of magic wand that would deliver extraordinarily superior economic growth, these analyses show quite how extraordinarily superior that economic growth would need to be. The SNP's own White Paper showed that cumlative 3.8% superior growth over 30 years was an empirically observed "bonus of being independent" - at that rate it would take over 100 years to close the fiscal gap identified by all these analyses. The alternative to more debt and/or more taxes is of course to reduce public expenditure. Here's where the absolute figures matter: we're now looking for £8 - 10bn a year of savings versus those costs allocated to us in the Scottish Government's own GERS figures. Without getting distracted here with the usual arguments (Trident, House of Lords, HS2, etc. ), suffice to say that nobody has come close to suggesting savings that would add up to anything like £8bn a year; the notoriously optimistic White Paper itself suggested only £0.6bn of net savings. For Scotland to accept fiscal autonomy without inbuilt UK-wide fiscal balancing would be tantamount to economic suicide. If Scotland becomes fully fiscally autonomous future generations will have two things to thank us for: more debt and higher taxes. But let's look back at the first of these conclusions: from a UK perspective, to what extent are we failing future generations by not paying enough tax (or spending too much) today? The first issue to consider is demographics: the ageing population. In our lifetimes we pay taxes to and receive expenditure from the State. At either end of our lives (when we're in education and in retirement) we are typically net beneficiaries and in the middle of our lives we are (hopefully) net contributors. The longer we spend in our dotage the longer we spend being net beneficiaries (through pensions and healthcare). This is of course why retirement ages are being increased - to make us net tax revenue generative for longer and to have a commensurately shorter period during which we will be a burden on the state. Needless to say, being a burden on the state really means being a burden on the next generation. This is where the Generational Accounting (GA) approach comes in. It aims to address the question of generational equity: what is the tax burden that we should incur now to avoid future generations having to incur an even greater tax burden? Based on the above dynamic you would think perhaps that the very act of running a deficit would create generational imbalance - by living longer we're going to be a more expensive generation to support in our dotage than the last one was, so why don't we need to be saving for that now? The answer of course is the countervailing influences of population growth, real productivity growth and other costs which may not grow as quickly (the benefits of national scale) . So let's get into some of the assumptions the NIESR have used. They assume that unallocated expenditure (UE4) either remains static in real terms or (even under the worst case scenario) only grows in line with population. To these arguably optimistic assumptions we have to add one important caveat about the GA approach: it explicitly assumes that all debt must be paid back (or to be more precise: as time tends to infinity debt must tend to zero). This feels pessimistic to me in that it implicitly assumes there isn't such a thing as a sustainable level of national debt. Feel free to grapple with the equations in the paper yourselves. I don't claim to have fully understood the analysis and may well have missed something. If I've understood the dynamics of the equations properly then the starting deficit and debt positions are in fact the dominant variables5 (at least when it comes to defining the FFA gap). But maybe we don't need to get buried too far into the detail. It seems intuitively obvious that if we don't do something about the scale of the UK's debt (by addressing the deficit) then future generations will be repaying our debt and shouldering some of the tax burden that we should surely be facing now. The NIESR analysis certainly seems to suggest our approach to fiscal policy is akin to our approach to climate change: we are in danger of leaving a generational legacy to be ashamed of. When our kids get round to working this out - when they realise we bequeathed them the certainty of more debt and higher taxes - they'll have every right to ask us: what the hell were we thinking? 1. Note on use of "increase in total tax burden"
For simplicity the NIESR state all of their findings in terms of tax as a percentage of GDP. To make the figures easier to relate to, I state them as an increase in total tax burden. To illustrate: the current UK tax burden is 36% of GDP, so a required increase of 3.6% of GDP would be a 10% increase in total tax burden. It's perhaps worth noting that if we were to translate these figures into "take-home pay impact" (i.e. if the increase tax revenue was to be achieved through income tax and NI alone) we would need to multiply the figure by 2.4 (NI and Income tax makes up 42% of total UK tax revenue; 1/0.42 = 2.38). So an increase in the total tax burden of 10% would mean a 24% increase in the Income tax and NI burden if that were to be achieved solely through payroll taxes. Of course the alternative to increasing taxes would be to reduce public expenditure; so you can take as read the words "and/or an equivalent reduction in public spending" every time a required tax increase is mentioned. Of course public spending is higher than tax revenue (hence the deficit) so the percentage reduction in public spending required will be slightly lower than the percentage increase in tax. 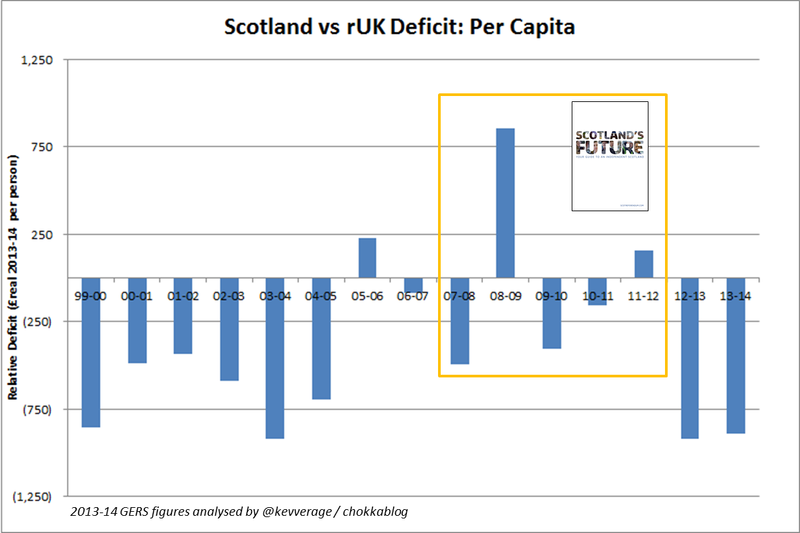 To illustrate: Scotland's 2013-14 deficit of 8.1% of GDP is as a result of spending being 23% higher than revenue, so e.g. a 16% increase in tax is equivalent to a 16/1.23 = 13% decrease in spending. The NIESR also has a go at calculating the Generational Accounts for Scotland under the devolution settlement currently being negotiated. Given there's conceptually no need for Scotland on its own to achieve intertemporal and intergenerational balance under a devolved arrangement (even if we accept the principle that the UK should) and the inevitable uncertainty around the nature of the future block grant, I'm leaving this analysis to one side. 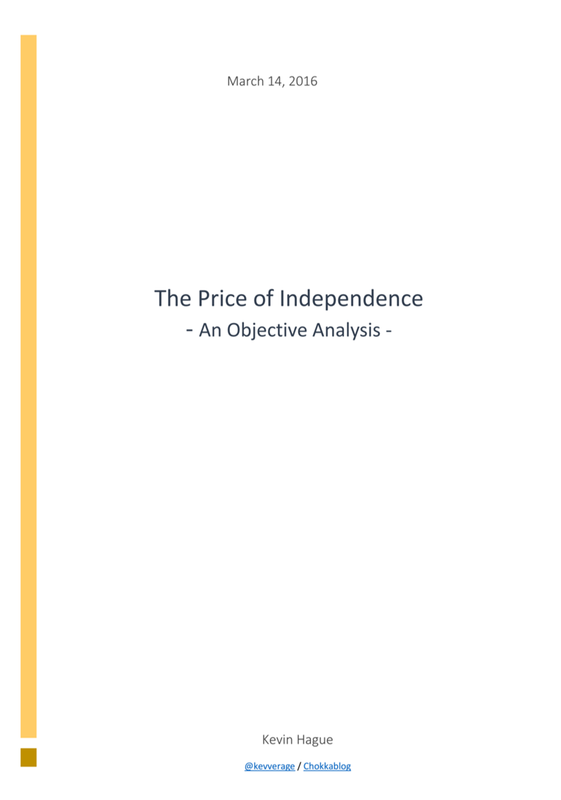 "One interesting result is that if we add the size of the required tax increase in the UK and the devolved Scotland scenario together, then the resulting tax increase would be about 1 to 2 percentage points of GDP lower (depending on the assumption about the unallocated public expenditures) than in the case of a “fiscally independent” Scotland." Scots are on average older despite dying younger. The obvious implication is that (differences in birth rates aside) proportionately more young people emigrate and/or less young people immigrate to Scotland. This is one of the reasons why Scotland needs economically productive migrants even more than the UK as a whole. The explicit assumption is that all debt is repaid by future generations (or at least that debt tends towards zero as time tends towards infinity). There is presumably an argument to be made for a sustainable level of debt which would lower the implied tax burden increase required. There is an assumed real rate of productivity growth of 1.5% compared to a real government discount rate of 3.0%. I think this means that if there were no age profile changes then the discounted contribution of future generations would inevitably be lower than today's. The observation (page 15) that the tax increase required for intergenerational balance is lower than that required for intertemporal balance suggests that the above difference in real productivity growth and real discount factors is more important than the increased burden created by changing age profile. I think. I wrote an intemperate rant on Facebook today as I didn't have the the time to write a blog post in my normal (I hope) more reasoned style. 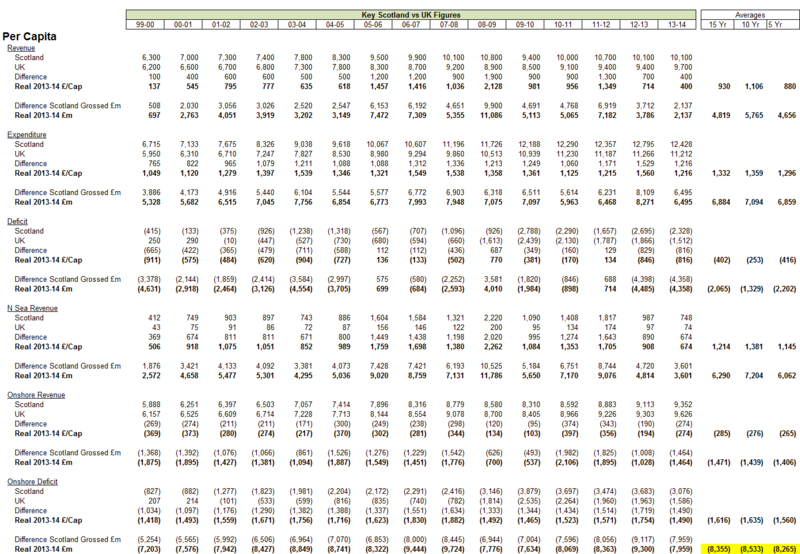 I've now taken the time to tidy it up and add in the data graphs that illustrate my points. She says politicians are mocking Scotland over the fall in oil prices. Mocking the SNP is not mocking Scotland; it's mocking the SNP. The SNP deserve mockery for basing the economic case for an independent Scotland on oil revenues of £6.8 - 7.9bn a year (when in fact we're now looking at £0.1 - 0.2bn a year). She suggests Scots deserve an apology. We do - an apology from the SNP for trying to win a Yes vote on the basis of a demonstrably false prospectus. She says Kez Dugdale appears to blame the SNP for the falling oil price. Kez was actually blaming the SNP for trying to win a Yes vote by making demonstrably (at the time) unrealistic oil revenue projections. She asserts Scotland will - over a decade - have "lost" £3.9bn under the Tories as we take our share of austerity cuts. The alternative would be of course for us to increase our share of the debt by £3.9bn (at least in the short term - we can debate the pros and cons of Tory austerity another day). The difference between the White Paper "low case" oil forecast and current OBR forecasts over the next decade is c. £67bn (that's right - I haven't missed a decimal point there) - an issue which is literally an order of magnitude bigger than "Tory austerity". She asks why Labour don't have more to say about that "vindictive attack on our people" - whilst spending the majority of her article attacking Scottish Labour. Joan being Joan we can infer that by "our people" she means Scots - neglecting the fact that we are simply taking our share of the UK's pain. Scots are not suffering more than the rest of the UK, so there's nothing "vindictive" about it. Of course because of Barnett, because of "pooling and sharing", we are suffering far less than we would if her party had fooled us into voting Yes. She says the "unionist parties" claim the oil slump makes independence impossible. Nobody claims it makes independence economically impossible, merely that the (now undoubted) economic hardship it would cause makes it politically extremely unlikely. She says "wealth per head in Scotland would be similar to the UK without including oil" and the Yes campaign "always said oil was just a bonus". We surely all see through this by now? By "wealth" she means GDP, from whence our taxes generate revenue. But she ignores the spend per head that (per the Scottish Government's own GERS figures) show us consistently c.£1,700 per head worse off than the rest of the UK without oil. That grosses up to £9bn a year. We are used to high levels of public spending in Scotland that we simply couldn't sustain were we independent without booming oil revenues. If Joan thinks austerity cuts of £0.4bn pa are unbearable, how on earth would she describe the £9.0bn pa of cuts (or increased taxes) that an independent (or FFA) Scotland would need without oil? Oil is no more a bonus than being able to fund Scotland's entire education and training budget (£7.6bn) is a bonus. She misquotes Standard & Poors (because she doesn't understand credit ratings) and quotes a credit report made before the oil slump. In fact Standard and Poor's said: "In brief, we would expect Scotland to benefit from all the attributes of an investment-grade sovereign credit [rating]". That means BBB- or higher. There are 8 grades between BBB- and the UK's AAA. She makes the observation that nobody predicted this level of oil price slump (which is true; not even Standard & Poors did) but ignores the fact that the White Paper low oil revenue forecast was £2 - 5bn higher than the OBR forecasts that existed at that time. That's the Office for Budget Responsibility, the people the UK government rely on - the clue is in the name. She asserts the oil price will rise again, ignoring the fact that it's North Sea profit that generates tax revenues ... and that profitability (due to rising extraction costs as fields mature) is in long term structural decline. The last time oil was at $100/bbl was in 2014 and we generated just £2.6bn in oil revenue. The White Paper "low" scenario was for £6.8bn (implicitly in perpetuity) and tax rates have been reduced since then (in an attempt to protect oil industry jobs). Implying the economic case for indy will be repaired by an oil price rise is simply nonsense - even before you factor in the volatility risk. She rants about the fact there wasn't an oil fund built. This is a point that is as true for the UK as it is for Scotland; it has absolutely nothing to do with the future, with the choices we (whether as the UK or as Scotland) now face. Needless to say if we (the UK) had created an oil fund then we (the UK, including Scotland) would have had to pay higher taxes or enjoyed lower spending to fund it. We were at the party, we drank our fair share. She talks of a "massive transfer of wealth" from Scotland to the UK. The Scottish Government's own figures show that this is nonsense. We were a massive contributor in the 1980's, on average we've been a large beneficiary since and certainly right now - to adopt Joan's language - there's a "massive transfer of wealth" taking place from the rest of the UK to Scotland. That's how pooling & sharing works. She asserts (ridiculously) that the UK "would have gone bust" without oil. That statement doesn't even merit a rebuttal. Finally she suggests an apology is called for. She's right: the SNP and the wider Yes campaign should be apologising for presenting a hopelessly optimistic economic case in their attempt to win a Yes vote. If they'd succeeded the Scottish people would be facing a level of economic hardship that would make current austerity measures seem trivial. I would also suggest that Joan should apologise for writing this nasty, vindictive, grievance mongering article in a national paper. You've got to admire the chutzpah of a man who can write that statement. It's obvious to even the most casual observer why a cheerleader for the SNP would rather we didn't look back at the case they presented; the SNP will be seeking our vote in May 2016, so of course they'd like us to think it "pointless and irrelevant" that they tried to persuade us to vote Yes on the basis of a false prospectus. On the back of the plummeting price of oil, Unionist parties revel in the fact that North Sea revenues are only going to be £0.1 billion next year, compared to the £6.8-7.9 billion forecast in the independence white paper. Of course, it should be pointed out that while the Scottish government’s central assumption was for the oil price to be $110 a barrel at the time of independence, Westminster’s department of energy and climate change predicted prices of $114-127 a barrel over the same period. And the Treasury publishes a monthly summary of figures produced by independent organisations - in May 2014 none of the 22 forecasters expected oil prices to fall to current levels, and 18 expected prices to remain above $100 a barrel in 2015. 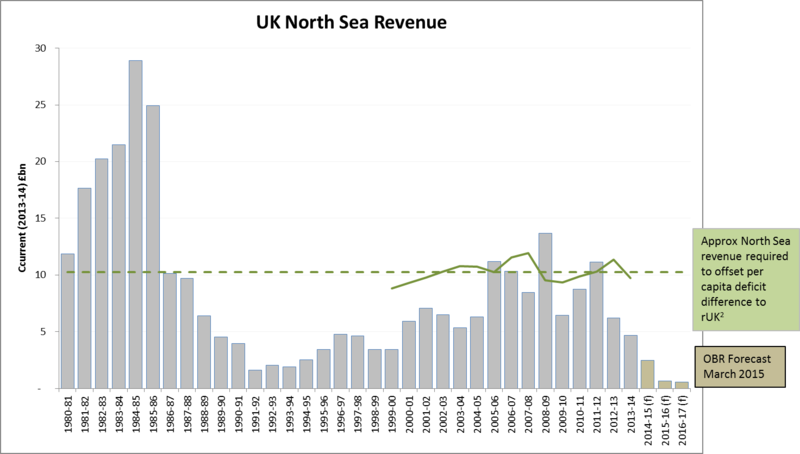 Let's put aside the childish suggestion that Unionist parties "revel" in the drop in North Sea revenues and focus on what he's doing here. The first paragraph refers to North Sea revenues, the second talks only of the oil price. He's relying on the fact that the casual reader will accept this elision, will allow North Sea revenue forecasts and oil price forecasts to be conflated into being effectively the same thing. Well they're not, as we'll come on to see. We need to get one basic point clear first though: the UK Government relies on OBR forecasts and has done since it was established in 2010. The OBR - the Office for Budget Responsibility - the clue is in the name. If you want to budget responsibly you can't simply ignore it. 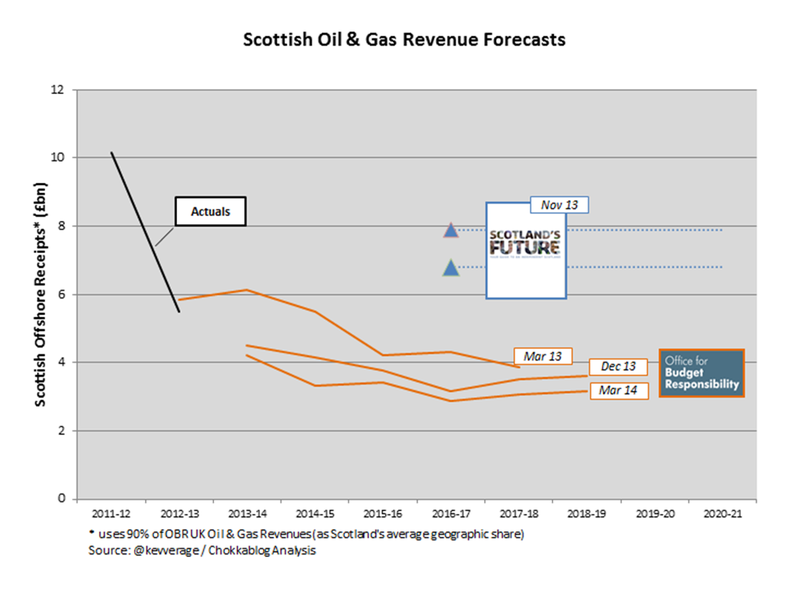 Needless to say the Scottish Government's Independence White Paper did just that - it ignored the OBR's forecasts for North Sea revenues (whilst relying on them for the base case onshore assumptions)1. But there'a bigger issue here. By focusing the reader's attention on the oil price assumptions he's distracting us from the actual oil tax revenue assumption. 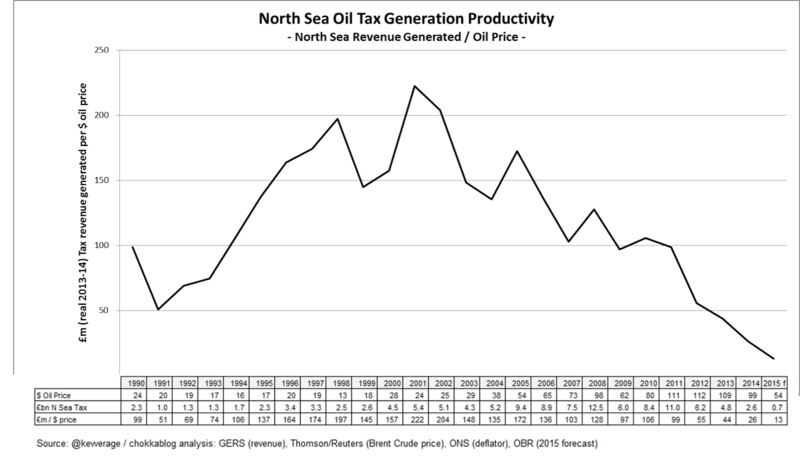 What's often overlooked here is that it's profit from North Sea production that is taxed by HMRC2 - so to get from oil price to North Sea tax revenue you also have to make assumptions about oil production volumes, production costs (hence profitability) and of course effective tax rates. So there are a lot of other assumptions we'd have to understand before we could judge whether the White Paper was in line with "Westminster" assumptions. Fortunately we don't need to bother ourselves with the detail, we can cut to the chase by comparing the Scottish Government's White Paper revenue forecasts with contemporaneous OBR revenue forecasts. The chart below does just that: it compares the White Paper scenarios published in November 2013 with the OBR forecasts published in March and December 2013 and March 2014 (6 months before the referendum). You don't need the benefit of hindsight to know that those are the words of a false prospectus; the lower of two scenarios they presented was £2bn- 5bn higher than contemporaneous OBR forecasts. That's not cautious, it's downright reckless3. Pringle goes on to point out that nobody forecast a price crash as severe as that we've seen. As with all good spin this truthful observation invites an untruthful inference: if everybody was wrong you can't blame the SNP for being wrong. This is of course nonsense: the SNP used assumptions that were far more wrong than the OBR, at the same time as falsely asserting they were using cautious forecasts. The fact that they presented two scenarios compounds this deceit. Anybody who understands planning knows scenarios are used to test a plan against a range of likely outcomes. Even a layman reading the White Paper would surely assume that the scenarios represent a reasonable range of probable outcomes. The authors were obviously aware of the OBR forecasts, so the only way using these scenarios could have been justified would have been if they'd labelled them "optimistic" and "hopelessly optimistic". The bottom line here is that the shortfall between reality and the White Paper forecasts is £6.7bn to £7.8bn a year. To put that figure in context: £3bn a year is Scotland's share of the UK's total defence budget; our total Education and Training budget is £7.6bn; £7bn is £1,300 for every man, woman and child in Scotland. Against this figure most other arguments pale into insignificance. Let there be no doubt; if we'd voted Yes the people of Scotland would be facing far worse austerity than we are today. By choosing to continue to pool & share our resources with the rest of the UK, we dodged a bullet. Mr Pringle and his fellow SNP cheerleaders discourage us from looking back on their false prospectus for one simple reason: if enough people look back and realise how close they came to leading us to economic disaster, they will be the ones getting the bullet come May 2016. For completeness I've updated the graph to show how the OBR forecasts have progressed since the Referendum; nobody will be surprised to learn that they have continued their record of always turning out to have been optimistic. They were wrong, they were optimistic - but they weren't half as optimistic as the Scottish Government. 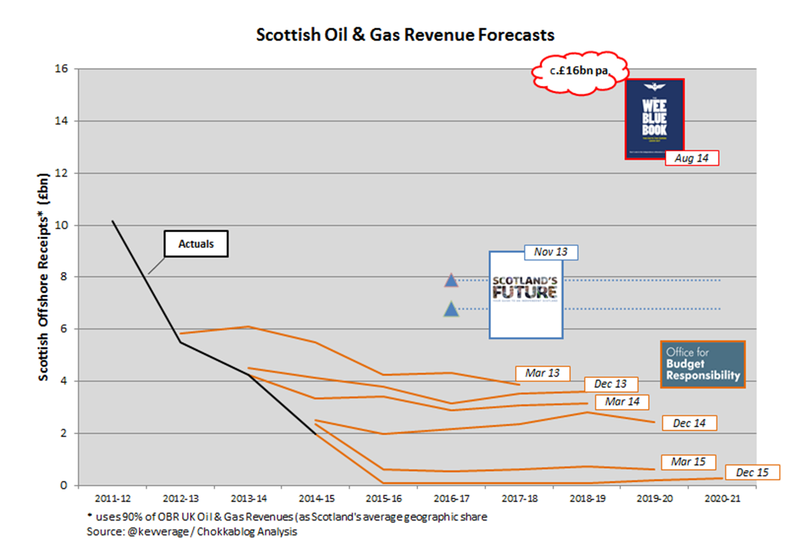 For added giggles I thought I'd include what Wings Over Scotland's Wee Blue Book had to say4 about the prospects for oil revenues. As I concluded in Wings and His Wee Blue Book of Errors; he was very very wrong indeed. page 604 and 605: explaining that the OBR projection for the total UK deficit is used for comparison purposes (which is of course inconsistent - if you choose to use a higher offshore projection for Scotland you should compare with a total UK figure using that higher projection ... but we'll let that pass). 4. On page 29 of the Wee Blue Book, having insisted that the UK government has been talking down oil (we now know the reverse was in fact true) he chooses to quote an academic who suggested "an independent Scotland's revenues in 2017-19 would be almost £32bn"
The often used comparison between Jeremy Corbyn and a geography supply-teacher clearly strikes a chord. In large part of course that's down to his appearance and manner - the bike, the dress sense, the way he gives the skunk-eye to those unruly kids on the opposition benches - but it's an image that chimes for a rather more important reason; nobody believes he's here to stay. In fact in recent weeks I’d suggest he’s been more like a boxer (in attitude, if not in appearance). Not a boxer who's bravely taking the fight to the opposition, more like a boxer who's decided to throw the fight and doesn’t care how obviously he does it. Cameron barely has to show his pasty knuckles before Jeremy helpfully throws his grizzled chin towards them. I won't waste time here detailing the series of prat-falls that the Corbyn-led Labour party has taken in this last week. Suffice to say that Corbyn, aided and abetted by loyal allies John McDonnell and Ken Livingstone, has overseen what John McTernan describes as "Labour's worst week ever". If you need convincing of quite how bad the last week has been, of quite how poor Corbyn's political instincts are, I recommend you read that article. Instead of dwelling on the series of tactical missteps that Corbyn has made, I'd rather use this blog to contemplate the lessons that the Labour Party has to be learning from this painful experience, to ask what characteristics the next leader of the Party will need to possess. Clearly the overwhelming majority of Labour's voting members believed that Corbyn was the right man for the job. There's no doubt that he's an admirably principled politician and I'm not personally bothered by his dress sense or even his depressingly anti-charismatic manner. What bothers me - what should surely bother anybody who believes that Labour values should be represented in government - is his lack of instinctive leadership skill. If that's a concept that Labour's voting members didn't understand or appreciate before electing Corbyn, it's one they surely must now. To be clear: I'm not arguing for somebody who has instinctive leadership skills instead of strong principles, I'm arguing that the Party has to rally round someone who has both. Whether in business or politics: successful leaders lead. Every week I’ve been asking people for their suggestions of what I could raise with David Cameron at Prime Minister’s Questions - and thousands of people send in their own questions. Over the summer, the parliamentary party got a decision badly wrong. We abstained on the welfare bill. Would we have made that mistake if we had asked you, our members, what we should have done? Why not give members the chance to take part in indicative online ballots on policy in between annual conferences - and give our grassroots members and supporters a real say? We want to see this democratic revolution extend into our party.. opening up decision-making.. to the hundreds of thousands of new members and supporters that have joined us since May. Some will read those words and think it's great that he's listening and trying to create a more democratic decision making process; I read them and despair. These are the words of a man abdicating his responsibility to lead. I want my Party leader to pin the government down at PMQ's with incisive and politically astute questions, not to read out letters. I want my Party leader to listen to their party and then to lead them - to take bold decisions, to be willing to change members' minds rather than just attempt to read them. A leader's job is to do much more than just divine the opinions of those they lead, their job is to do more than just act as a conduit for the aggregated opinions of those their followers. This matters not just in terms of how Corbyn leads the Labour Party, it matters because the Party needs people to believe he would be capable of leading the country. In a representative democracy the people delegate decision making power to politicians; that's how we actually get things done. We appoint our representatives, expect them to ensure they are well informed (in a way that only somebody for whom it's a full-time job could) and place our trust in their judgement. We delegate responsibility to our elected representatives, we don't expect them to swing round and delegate back to us, we expect them to get on with business. Elections are where we pause and pass judgement on whether they have served us well or let us down. I get the impression that were Corbyn PM he would happily run daily referendums rather than take decision making responsibility himself. That approach wouldn't be a triumph of democracy, it would paralyse the function of government. I'm exaggerating of course, but think about it. Would Steve Jobs have revolutionised the way we use technology if he'd taken a more democratic approach to decision making? Would the Chief Executive of any business be successful if their corporate strategy was determined by polling their employees? I've never been a fan of Thatcher's political convictions, but she was undoubtedly a politician who got things done. When asked whether she believed in consensus she famously replied: "Yes, but it should be a consensus behind my convictions". I'm pretty sure from Attlee and Churchill through Thatcher and Blair you'd find politicians who got things done shared some of that attitude. It's about having conviction, trusting your instincts and being willing to lead. Which is where we return to the problem with Jeremy. There's no doubt he has conviction, but there's considerable doubt as to whether he trusts his own political instincts. From "would you press the button" to "shoot to kill", his faltering responses betray the fact that he knows his convictions are out of kilter with majority public opinion. As for willingness to lead - well you just have to read that extract from today's speech to know the answer to that. He doesn't want to take responsibility for difficult decisions; he's throwing the fight. So if not Corbyn - and it's surely not - who is the person who has both the conviction and instinctive leadership skill required to get the Labour Party back on track? I don't know, but I do know that sensible party members had better work out who it is pretty quickly and rally round them. I'm delighted that more and more people who are avowedly committed to the Yes cause - who believe that Scotland should definitely be independent no matter what the economic implications - are starting to actually engage with what those economic implications might be. As a result there have been two questions raised about the methodology I used in Full Fiscal Autonomy for Dummies (and more generally when comparing Scottish and rest of UK economic statistics). These are good questions, so I think its worth answering them. Quoting figures on a per capita basis (or as Alex Salmond used to delight in saying "for every man, woman and child in Scotland") is common practice - people can relate to the idea of their own personal contribution, to their own pay-packet. Oil tax revenues are notoriously volatile (that's kind of the point) and so Scotland's GDP is itself volatile. If (for example) we look at a time-series of public expenditure as a %age of GDP it is harder to interpret than public spend per capita (e.g. has it gone down as a %age of GDP because it's gone down in total or because GDP has gone up?). Similarly if we want to disaggregate the contribution of Oil & Gas Tax revenues from other (aka Onshore) Tax revenue, which GDP number do we use as the denominator? We could include Oil & Gas in the GDP in both cases or indeed if we could include it in one but not the other - either way it becomes harder to understand what is causing observed fluctuations. Finally, the Scottish Government's preferred allocation methodology for nationally shared costs (debt interest, defence expenditure etc.) is on a per capita basis. When the indyref was in full flow there was broad agreement that (were it to happen) debt allocation would take place on a per capita basis. Given that (up until about now) Scottish GDP/Capita has been higher than the UK average for many years, it goes without saying that if you allocated these costs on a GDP share basis Scotland would appear worse off. So, given my objective was to drill down and explain how the Scottish Economy differed from the rest of the UK, it made sense to use a per capita basis. That the resulting graph (see below) showed such a remarkably stable picture of onshore revenues difference and public expenditure difference per capita kind of proves my point: this is an enlightening way to look at the data. I do all of my analysis comparing Scotland to rUK (where rUK is the UK excluding Scotland). As with any good analysis there isn't a right and wrong answer here - it depends what you are using the figures for, how you interpret them. The Nationalists delight in making the debate about us and them - although "we contribute more than them" is heard rather more often "we get more spent on us" (and even the former won't be heard now oil has all but disappeared as a tax revenue generator). In that context it makes sense that "us" is Scotland and "them" is rUK, If the debate is about how much we pull our weight (the extent to which we give or receive more) within the UK then it makes sense to compare Scotland versus rUK. If you're asking "what would the difference be for the Scottish population between Scotland standing alone and remaining fully pooled and shared within the UK" then it makes sense to compare Scotland with total UK (with us in it). If we're looking at Full Fiscal Autonomy (as the blog post I'm referring to does) then we need to understand what it would take for Scotland not to be dilutive to the UK economy (for the rest of the UK not to be subsidising us indirectly through supporting the shared currency). In this case it's appropriate again to look at Scotland vs rUK. It depends what you are using the analysis for. One of the more bizarre suggestions is that I chose this methodology to make Scotland look worse - given that it makes Scotland look better in terms of relative tax contribution (and when we're a net contributor) that accusation makes no sense at all. I hope the merit of the Full Fiscal Autonomy for Dummies blog post is that by sticking to a single definition for comparison purposes (per capita and vs rUK) we can walk all the way through the figures understanding them in a way which is consistent with the language of the debate. It provides a clear and easy to follow explanation. I stand by my position that for Full Fiscal Autonomy analysis it is correct to use Scotland vs rUK and that it is simpler to understand the figures and the debate in terms of per capita figures. I'm very clear about my definitions and the deficit gap I'm identifying is identified on a per capita basis. I happen to agree that it's better to define the deficit gap on a %age GDP basis, but it's harder to create a consistent numerical narrative if you do the analysis in that way - for the reasons I explain above. What matters of course is what difference would it make? This is why I'm so pleased that devoted Nationalists are engaging with this question. If they would rather define the deficit gap on a %age GDP basis then they really should. It would make a big difference if our GDP/capita was hugely different from the rest of the UK, but it's not. That's why some of the more wild-eyed cybernats have to use illustrations pretending we're like mexico versus the USA or that our population might be boosted by zombies who wouldn't impact our GDP or spending (yes, really). If they want to talk about the "independence difference" rather than the "FFA Challenge" (although I still don't think many of them have understood this subtlety) then they should do the analysis versus UK instead or versus rUK. As with my previous blog: I applaud their engagement with the analysis. It's a good thing. I have given up waiting for those who challenge the methodology I used to re-run the analysis on a %age GDP and vs Total UK basis so I've done it and decided to post it here. This way people can see why they're so reluctant to do it. Remember we're looking at the Onshore deficit gap (i.e. 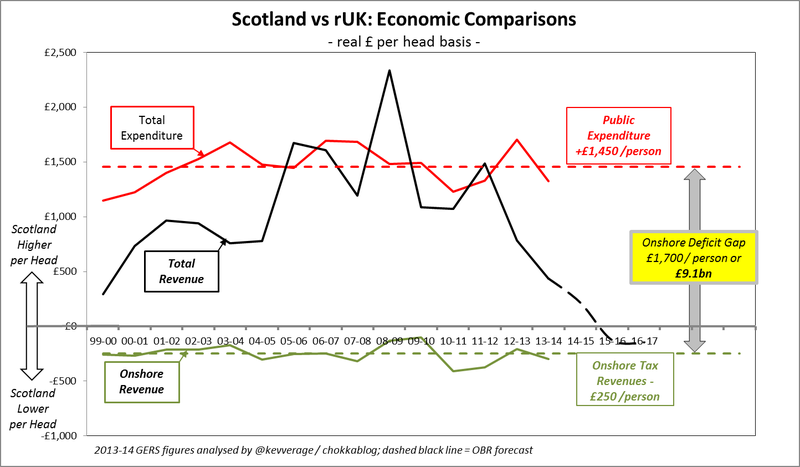 the difference between Scottish and UK economies if there was no oil tax revenue) so that we can see what the underlying gap is. This gap has in the past sometimes been filled to over-flowing with oil, but given how bleak the oil outlook is now it would likely need to be filled with tax rises or spending reductions (or - for as long as it would be sustainable - greater borrowing). The view as to how necessary it would be to close this gap varies depending on your perspective: if we were Fully Fiscally Autonomous the rest of the UK would require us to close the gap to avoid the rest of the UK subsidising us by supporting our shared currency (see Eurozone). If we were independent we might choose to simply run a higher deficit and build up yet more debt - but by any measure if we don't close the gap we'd be worse off. So let's plot the deficit gap over time using the two alternative methods. 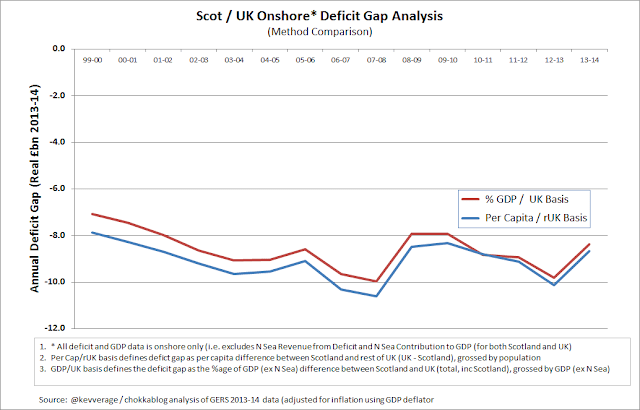 For the per cap / rUK method this is effectively a plot of the gap between the red and green lines in the graph above. As I've argued throughout - the methodological difference is very small. Hardly surprising given our onshore GDP/Capita is so similar and we represent under 10% of the UK. As you can see the lines actually converge in more recent years: the last 5 year averages are £9.0bn and £8.8bn respectively. I think we can safely say that the Onshore deficit gap is stable at around £8.5 - 9.0bn (I've consistently argued for +/- £0.5bn on these figures anyway). Let me repeat here for the avoidance of doubt: were we to be independent or fiscally autonomous we would not expect this gap to remain the same. The gap is a function of being in the UK, sharing a tax system (and currency), generating slightly less onshore tax and having a lot more spent on public services (as UK Pooling & Sharing allows). What this analysis shows us is: to not be worse off than we are now (at least from a net fiscal balance perspective) we'd need to find £8.5 - 9bn from some combination of N Sea revenues, higher tax rates, higher economic growth and/or public spending cuts. This analysis is simply a guide to scale, it gives us a clear indication of the size of the challenge we'd face, it tells us broadly what we'd need to believe for separation or Fiscal Autonomy to make economic sense. The last time oil was at $99/bbl (in 2014) we generated only £2.6bn of tax revenues - and tax rates and N Sea profitability have declined since then. I understand why committed separatists would rather talk about theoretical examples involving Snow White and Zombies (yes really) or why they'd rather play with numbers for Mexico and the USA (don't ask me). But the harsh truth is these number represent the best understanding we have of our economic situation and they expose very clearly what many of us were saying all along: oil was never a bonus, it was the bedrock of the economic case for Independence. Without that oil, there is no economic case for independence.